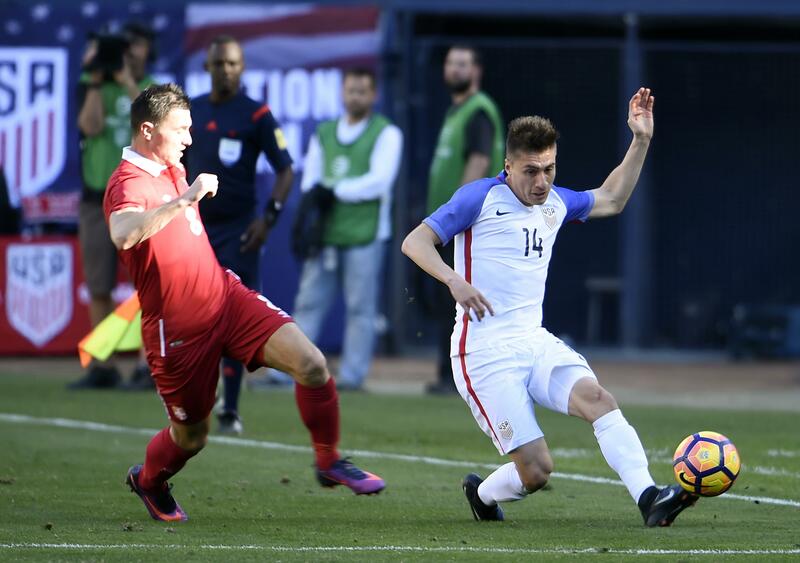 Sun., Jan. 29, 2017, 9 p.m.
SAN DIEGO – Bruce Arena’s second stint as U.S. coach began with the same result as his first, a 0-0 exhibition draw. The United States had just one shot of target against a young Serbia team on Sunday, the first game for the Americans since Jurgen Klinsmann was fired after a pair of losses in World Cup qualifiers in November and replaced by Arena. Arena led the U.S. to a 71-30-29 record in his first stint, becoming the winningest coach in American national team history and earning election to the National Soccer Hall of Fame. He opened with a tie against Australia in 1998 and was fired following the team’s first-round elimination in a loss to Ghana at the 2006 World Cup, then returned to Major League Soccer and led the LA Galaxy to three league titles. He used mostly U.S.-based players following a three-week training camp. The U.S. plays Jamaica on Friday in an exhibition at Chattanooga, Tennessee, then resumes qualifying. After losing its first two games in the final round of the North and Central American and Caribbean region, the U.S. hosts Honduras on March 24 at San Jose, California, and plays four days later at Panama. The top three nations in the hexagonal qualify for the 2018 tournament in Russia and the No. 4 finisher goes to a playoff, so there is time to recover. Jozy Altidore became the 17th American men’s player to make 100 international appearances, at 27 years, 84 days the second-youngest behind Landon Donovan (26 years, 96 days). Sebastian Lletget, a 24-year-old midfielder, entered at the start of the second half in his national team debut. Chris Pontius, a 29-year-old midfielder, made his debut in the 65th and Jorge Villafana, a 27-year-old defender, in the 69th. Benny Feilhaber, now 31, entered in the 77th in his first appearance since January 2014. A member of the 2010 U.S. World Cup roster under Bob Bradley, he played in just three games under Klinsmann. The best scoring chances were just before the final whistle. U.S. goalkeeper Nick Rimando made diving parry to his right on Lazar Jovanovic’s angled 10-yard shot in 89th. The U.S. countered, and Chris Pontius slid a shot just wide after Juan Agudelo failed to get an attempt off. Markings on the field were still visible from the last San Diego Chargers’ game before the team announced its move to Los Angeles, a loss to Kansas City on Jan. 1. With Brad Guzan among the Europe-based players not available and Tim Howard recovering from leg surgery, the 37-year-old Rimando started in goal. Arena used a 4-2-3-1 formation that had Graham Zusi at right back with Steve Birnbaum and Chad Marshall in the center and Greg Garza at left back. Bradley and Jermaine Jones were in defensive midfield, with Sacha Kljestan in an advanced midfield role, Alejandro Bedoya on the right flank and Darlington Nagbe on the left. Altidore was the lone forward. Usually a midfielder, Zusi made his first international start at right back. Marshall had not played for the U.S. since January 2010 against Honduras and Rimando since April 2015 versus Mexico. Nagbe had not started since June 25 last year at Colombia at the Copa America. Serbia, missing stars such as defenders Branislav Ivanovic, Aleksandar Kolarov and Nemanja Matic, opened with a lineup that had totaled just five previous international appearances. Published: Jan. 29, 2017, 9 p.m.